The StFX Department of Athletics honoured its 2017-18 U SPORTS Academic All-Canadians on Jan. 28, 2019 at their annual celebratory breakfast. This year, there was a record-high 96 Academic All-Canadians, those student-athletes who have achieved an 80 per cent average or above while consuming a year of eligibility competing for a varsity team. The number was an increase from the previous high of 82 Academic All-Canadians in 2016-17. “It is important that we pause to celebrate the fantastic academic accomplishments of our student-athletes,” comments StFX Director of Athletics & Recreation Leo MacPherson. Out of the possible 290 eligible student-athletes who consumed U SPORTS eligibility by participating on a varsity team at StFX during the 2017-18 season, 33 per cent achieved Academic All-Canadian status, including 40 male and 56 female student-athletes. The X-Women soccer team had the highest percentage of any StFX team with 80 per cent of their team members earning the distinction. There were 52 first-time Academic All-Canadians, 22 student-athletes who received the honour for the second time in their career, and 12 who were three-time Academic All-Canadians. 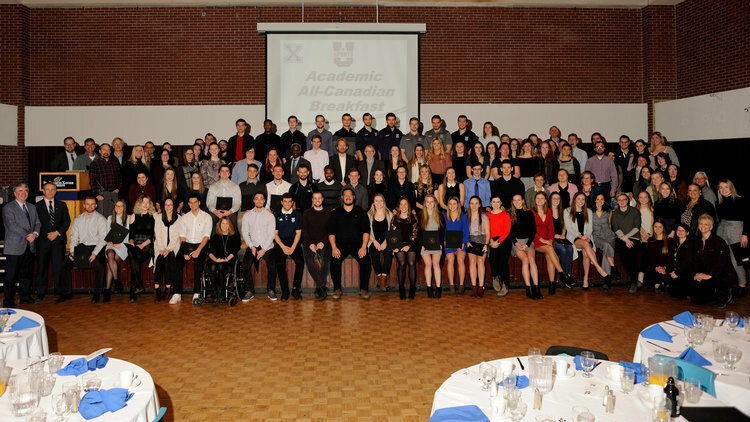 Ten student-athletes earned the elite distinction of being a U SPORTS Academic All-Canadians four times including: Chloe Brennan (soccer), Elise Brennan (soccer), Craig Duininck (hockey), Liam Elbourne (soccer), Kristoff Kontos (hockey), Olivia MacDonald (cross country), Cole Suart (soccer), Alex Taylor (soccer), Erin Visser (soccer) and Marco Zanchetta (soccer). 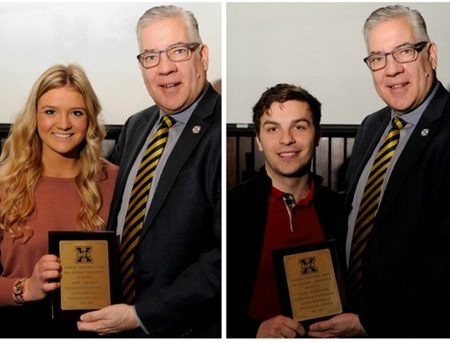 The Athletics Director’s awards for academic achievement, presented to the top StFX male and female academic student-athletes were Amy Graham from the X-Women hockey team and recently named Rhodes Scholar Liam Elbourne from the X-Men soccer team who received the honour for the second consecutive year. The 2017-18 Academic All-Canadians were honoured at a celebratory breakfast at the Bloomfield Centre where they received a certificate from U SPORTS along with a gift from the Department of Athletics. All student-athletes were encouraged to invite a faculty member to accompany them to the breakfast. The breakfast kicked off StFX Athletics annual Faculty Appreciation Week.